Most voters are smarter than just about anyone has ever given them credit for. For instance, they will tell you exactly what they think. It’s the question that’s important. Remember the good old days, maybe just one general election ago, in 2012, when voters felt alienated? That was back before most folks realized that there was more at play than just a case of misunderstanding the political ambitions of candidates. Armed with research of voter sentiments, the candidates too have mistakenly believed that feeding a line of eloquent slight-of-hand to simply show some empathy with contemporary social sensitivities might be a good way to get elected. But, all this, I think, is predicated upon bad or mis-applied polling. What “people” were compelled to express to pollsters in those “alienation” days actually concealed a real and growing public assessment and understanding that wealthy persons shape the laws more than they could ever have imagined. 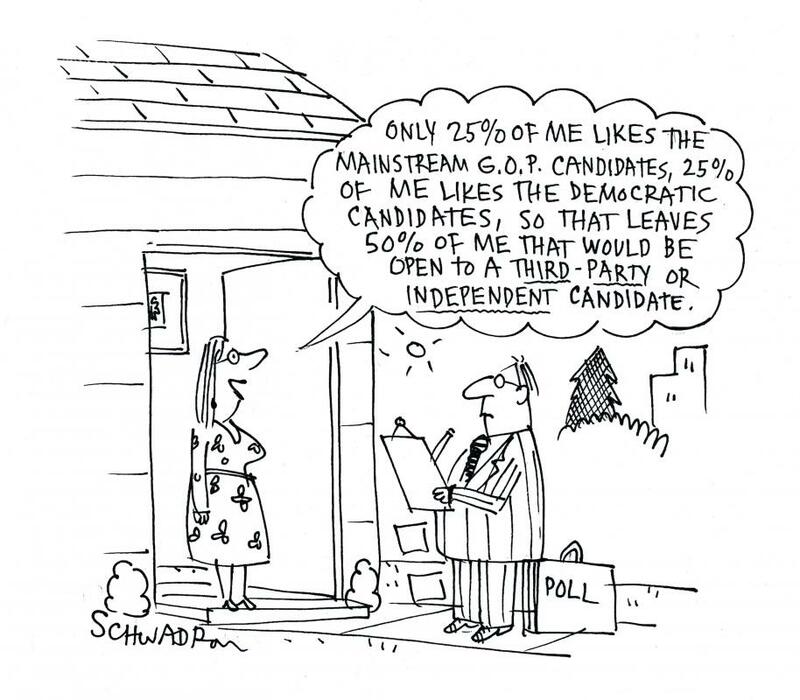 Nowadays, a potential candidate might do well to stay out of this game unless and until he or she undertakes a serious study of populist thought among potential constituencies, filtered by honest self-evaluation. How else can one determine if a set of beliefs are in line with some kind of truth? Too much time and money is involved to simply experiment with half-baked concepts on real human beings, mis-identified as an adoring public. What President Obama (and frankly, I really like him) failed to do in his bid to attain the Presidency was not intentionally deceitful to the voters so much as to himself in cynically overlooking the serious issues of human equality and instead viewing and passing along the results of skewed polls as voter disenchantment. Disenchantment demands assurance, and he’s good at re-assuring folks – at least he used to be. It was at best ill-advised to try to mitigate or even ignore the damage caused by the rampant selfishness of a few. He has had a multitude of opportunities to publicly and fearlessly scold Congress for failing to act on programs which could lighten the load of economic recovery carried, for the most part, on the backs of ordinary Americans. And it is precious little satisfaction that he persists in believing that carefully crafted tax laws alone could ever provide real economic justice. He and all of us would do well to just understand that self-serving practices are truly beyond bad now and that charitable thinking is fundamentally unenforceable. A sizable majority of Americans, and not just Democrats, currently believe that policies today favor the wealthy. Statistically, among that majority of those taking a sober look at this are millions of Americans – millions of millionaires who incredibly may be deceiving themselves into believing they will escape having to just step up and do the right thing about it. Whatever ambitions and programs our nation might officially embark upon, the individual should still concern himself with his responsibilities to a healthy society by whatever means his conscience will dictate. Leave the back-patting and finger-pointing to sports figures. Leave the political rantings on the disposition of church and state to the orators of the world. Anyone who has ever thought to undertake the responsibilities of public office has my great respect. I have always believed however that running for office must require a willingness to examine the potential conflicts that exist between societal and personal truths. And there are some politicians, though very few, who have found a lovely balance within those truths. An honest self-examination will surely reveal that none of us is purely conservative or liberal; nor are we strict adherents of any political party’s mission. We should bring our honesty and our honest differences to the table and talk about it. And, put it on the calendar for, say, right now. Let’s get serious. Let’s seriously try to get along. God knows, it’s high time.